The United States Ambassador to The Gambia, Her Excellency Patricia Alsup, has described as ‘’excellent’’ the relationship between The Gambia and the United States. According to her, the ties between the two allies has improved tenfold since the advent of the Barrow government. 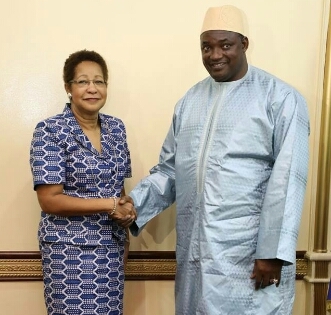 Ambassador Alsup, who has come to the end of her diplomatic duties in the country, made the remarks on Tuesday after she bid farewell to His Excellency, President Adama Barrow in a closed-door meeting at the State House in Banjul. She started her diplomatic tour of duty in The Gambia in 2016. The American diplomat said the Gambia-US cooperation is strongest than at any period in the past few decades, adding the two countries have a solid partnership that has been strengthened since the Barrow administration took over. ‘We have a number of US agencies that are working here; assistance to The Gambia has multiplied tenfold since this administration commenced,” Ambassador Alsup told State House press corps. She disclosed that The Gambia stands to benefit greatly from US development assistance through the Millennium Challenge Corporation (MCC) programme, which supports developing countries to reduce poverty and promote economic growth. While expressing admiration for the leadership style of the president, Ambassador Alsup expressed optimism about the trajectory of the ties between the two countries. “I think he (President Adama Barrow) appreciates the work that the US is doing to try to support The Gambia. I think that he will continue to make sure that the relationship between the US and The Gambia continues to be a strong one, and in fact gets even stronger,” she said, lauding a lot of things done during her tenure as top US diplomat. Ambassador Alsup further noted that the transition has registered a lot of progress citing that the high level freedom in the country as well as the impressive human rights records of the current administration. She also highlighted the $1.7Billion pledge for the NDP blueprint as a clear testimony that the international community is impressed with the progress being made by the Government in the development of The Gambia.